Robert Crouse (1930-2011) was a noted Patristic and Medieval scholar, and a teacher and priest in the Anglican Church of Canada. He was a bulwark of orthodox faith, and was even said to be "the conscience of the Canadian Church". His passion was was the poet theologian Dante Alighieri (1265-1321). From 1990 to 2004 Dr Crouse frequently served as Visiting Professor of Patrology at the Augustinianum of the Pontifical Lateran University in Rome. He was the first non‐Roman Catholic to be invited to this position. Today is the Feast of the Epiphany - that great festival on which Christians, for at least fifteen hundred years, have celebrated the manifestation, or showing forth, of the glory of God in Jesus Christ, the Eternal Word of God made flesh. Just as the showing forth of the glory of God in Christ takes many different forms, so our season of Epiphany commemorates many different things. First, the coming of the wise men from the East to worship at the cradle of the Infant Christ; then, the Baptism of Jesus in the river Jordan by John the Baptist, with the voice from heaven declaring that this Jesus is the beloved son of God; then the visit of Jesus, at twelve years old, to the Temple at Jerusalem, where the learned doctors were astonished by his understanding and his answers; and then, a series of Jesus' miracles: the changing of water into wine at the marriage feast at Cana; the healing of a leper, and the centurion's palsied servant; and the calming of the troubled sea. Then, at the end of the season of Epiphany, we have prophetic lessons about the final coming of the Son of God, in power and great glory. Many different things - a great diversity of commemorations; yet they are tied together by one common theme. They are all aspects of the showing forth, the shining forth, the "Epiphany" of the divine glory of Jesus Christ, the Eternal Son of God, the Eternal Word of God, made flesh. Thus these many commemorations of Epiphany make up a continuing meditation upon the meaning of the Christmas miracle - the miracle of God with us, God in our flesh, Emmanuel, God visible to human eyes, God audible to human ears, God tangible to human touch, God manifest in human life, judging, restoring, and transforming it by the grace and truth he brings. "The Word was made flesh and dwelt among us (and we beheld his glory, the glory as of the only-begotten of the Father), full of grace and truth." On the Feast of Epiphany itself, tomorrow, we commemorate especially the coming of the wise men. "When Jesus was born in Bethlehem of Judea, in the days of Herod the King, behold, there came wise men from the east to Jerusalem, saying, Where is he that is born King of the Jews? For we have seen his star in the east, and are come to worship him." Those learned travellers - perhaps Chaldean scientists, astronomers (actually, we know very little about them) - came first to Jerusalem, the Royal City, the obvious place to look for the new-born Jewish King. But, instructed by the Scriptures, they were directed further on, to Bethlehem, and it was a strange sort of King they found there: they found a little child there, with Mary, his mother, and they fell down and worshipped him. There, at the manger, they offered their symbolic gifts; god., acknowledging a king; incense, the symbol of God's presence; and myrrh, the ancient funeral spice, recognizing the mortal human nature of the Son of God, destined to suffer and to die in sacrifice for all mankind. A remarkable performance, really. What was there, after all, about the humble manger scene to suggest the divinity, the kingship, and the sacrificial destiny of the Infant Christ: How was divine glory shown forth there? 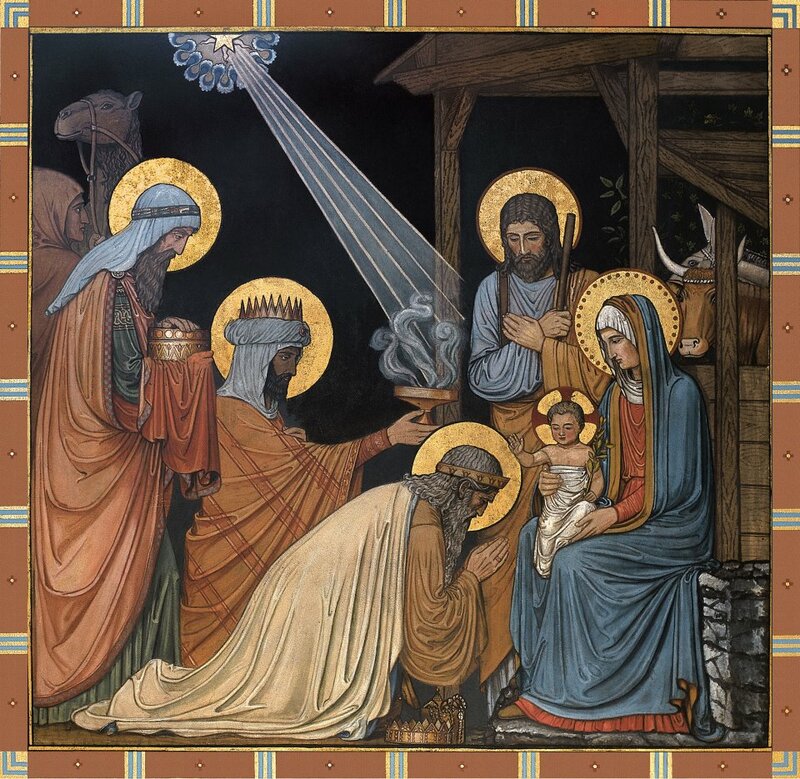 Surely, it was a glory visible only to the eyes of faith: faith, to see in a helpless infant, who cannot even stutter, the Almighty Word of God; faith, to see the King of Kings, and Lord of all the worlds, in a swaddled baby, who cries for mother's milk; faith, to see the Very Son of God, "God of God, Light of Light", in all the poverty of a cattle stall, exposed to all the bitter winds of human indifference and disdain. A remarkable performance, certainly; but that, you know, is the proper work of faith, and the pattern of faith for all of us. "Where is he that is born King of the Jews: Where is the Son of God, who comes to save us: Where is that Bread of Life for whom our spirits faint? Faith bids us find him, as it were, in a stable. Faith bids us find the Word of God in human words; faith bids us taste the very life of God in bread and wine; faith bids us see the Son of God in one another - in the least of these his brethren, to see and to declare his glory shining there. Our human inclination is ever to lust for the spectacular, the novel, the entertaining, the compelling. We look for something new and different, some "gimmick", some new recipe that promises what we call success. But faith ever calls us back, to work out our salvation in the common, everyday life of the Christian fellowship, the disciplined routines of Christian worship, prayer and study, and works of Christian charity. Christian life is not fundamentally the fevers and chills of emotional excitement: it is rather the careful, thoughtful learning of the Word of God, day by day, year by year; the nutriment of the Christian sacraments, and the deeds of love and mercy which flow from Christian charity. In the normal, everyday things of the Church's life - the words of Scripture, prayers and sermons, the outward signs of sacraments - the world sees only human words, only poor and common things: halting human speech, a bit of water, bits of bread and wine, and so on. But faith has eyes to see in all these things the shining forth, the "Epiphany" of the Son of God, the miracle of God with us, Emmanuel. And faith has gifts to offer him; not much, perhaps, in worldly terms, but by his own grace we have that one best gift, acknowledging his divinity, his kingship, and his sacrifice, the gift he treasures most - the gift of adoration, the gift of the humble obedience of mind and heart. Bring and adore him; the Lord is his Name!" Thank you, Bishop David, for posting this. WONDERFUL Post.thanks for share.you have a great blog here at fministry.com!.more wait ..